(a) Apply positive (+) battery voltage to connector terminal 2 (B). Do not apply positive (+) battery voltage to any terminals other than terminal 2 (B) to avoid damaging the pulse sensor inside the motor. (b) Connect a ground lead to connector terminals 1 (GND) and 7 (DOWN) or 10 (UP). Connect a positive (+) battery lead to terminal 2 (B), connect a negative (-) battery lead to terminal 1 (GND), and keep them connected for 3 seconds or more. With terminals 2 (B) and 1 (GND) connected, connect a negative (-) battery lead to terminal 10 (UP). Disconnect and reconnect a negative (-) battery lead to terminal 10 (UP) within 1 second. With terminals 2 (B) and 1 (GND) connected, connect a negative (-) battery lead to terminal 7 (DOWN). Disconnect and reconnect a negative (-) battery lead to terminal 7 (DOWN) within 1 second. 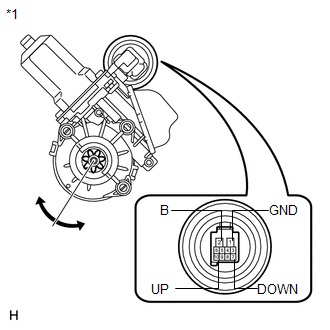 If the result is not as specified, replace the front power window regulator motor assembly LH. Reset the power window regulator motor (initialize the pulse sensor) after installing the power window regulator motor and regulator assembly onto the door. 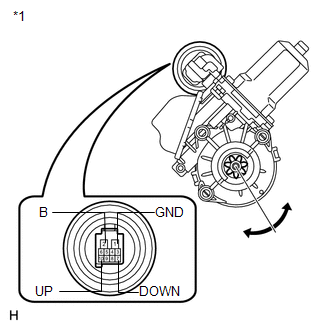 If the result is not as specified, replace the front power window regulator motor assembly RH.